Sammy McIlroy was born on 2 August 1954 in Belfast, Northern Ireland. He was an intelligent and very skillful midfielder. 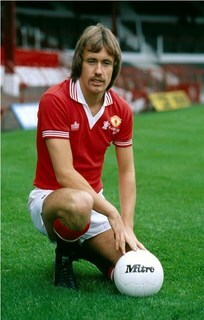 McIlroy was spotted in the Manchester United talent search Bob Bishop playing in his native city. At just 15 years old he arrived at Old Trafford while legendary manager Matt Busby was still manager. He was the last of the Busby Babes. He was dubbed "The Next George Best" and in his first time debut match in 1971 at age a 17, he scored in a 3-3 draw in the Manchester derby againts Manchester City at Maine Road on 6 November, but wasn't able to win a regular first time until the 1974-1975 seasons. This was shortly after United slipped out of the top flight, but he helped them shoot straight back up again, finished third in the top flight a year later and also reach on FA Cup final loss to Southampton. A year later, McIlroy picked up a winner medal as United triumphed 2-1 againts Liverpool. A runner up medal in the FA Cup followed two years after that as United were defeated 3-2 by Arsenal, with McIlroy equalising for United having been 2-0 down, only for Alan Sunderland to dramatically win it for Arsenal minutes afterwards. In International career he played for Northern Ireland with 88 caps with 5 goals. He played in all of the country matches during bot the 1982 World Cup, where Northern Ireland defeated the hos nation Spain and advanced to 2nd round an the 1986 World Cup in which he captained the team. He was also part of the Northern Ireland side which won the final Home International Championship. It’s spelled “il”, not “ll”.